Artist Tony Collantes creates a mural of a colorful skull with Greenpeace's 'Detox' campaign legend below it in downtown PV. Detox is focused on exposing links between clothing brands and toxic water pollution. Puerto Vallarta, Mexico - Last weekend a new mural was brought to life in downtown Puerto Vallarta. 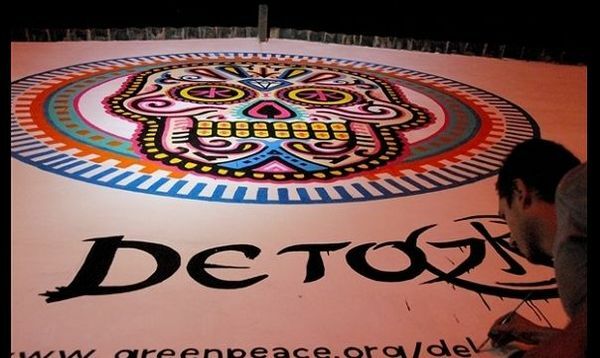 If you walk down Morelos street, you will find a colorful skull with Greenpeace's global "Detox" campaign legend below it. The Detox campaign was launched in 2011 to expose the direct links between global clothing brands, their suppliers, and toxic water pollution around the world. Fieldwork and investigations in manufacturing countries, along with the testing of branded garments for traces of hazardous chemicals, resulted in the release of groundbreaking reports that exposed the toxic truth behind our clothing. The documentary shows a Mexican family that wants factories held accountable for pollution they cause. Last Thursday, just eight days after Greenpeace launched its "Toxic Threads: Under Wraps" report in Mexico and screened a documentary about a family struggling to hold factories in the region accountable for the pollution they are causing, Levi Strauss & Co. decided to join the 10 other clothing companies (including the world's largest fashion retailer, Zara) that have made the commitment to go toxic-free. Levi's will begin requiring its largest suppliers (each with multiple facilities) in China, Mexico and elsewhere in the Global South to disclose pollution data as early as the end of June 2013. This means that's those living near all these facilities gain crucial access to information about discharges into their local environment – a basic right that up to this stage they had been denied. But rather than use hazardous chemicals in the first place, Levi's will look for non-hazardous alternatives. This is a bold move away from its previous position, which was focused on managing rather than eliminating hazardous chemicals. On December 8th, 2012, on Global Action Day, over 700 activists, in 17 countries and 81 cities, made their voice heard with different actions focused on convincing the world's biggest denim brand to "Go Forth and Detox." In Mexico City, activists wearing Catrina costumes took over the Levi’s store in Coyoacan, demanding that the jeans company take action and stop polluting the rivers of their country. Tony Collantes' mural in downtown Puerto Vallarta is another effort in this well-planned campaign to let clothing manufacturers that have failed to take responsibility for the pollution they create, to make a commitment to stop using toxic substances.